Today marks the start of TED2018, the latest edition of the world’s best-known modern conference. Participants in Vancouver will be treated to high-quality talks from well-prepared speakers, and will leave feeling energized and inspired. Back in the office, you and your colleagues will no doubt be subjected to low-quality presentations from poorly-prepared speakers, and you will leave feeling bored and uninspired. Business presentations are not TED talks. A board meeting is not a stage with a round red carpet. Yet businesses can and should learn a few vital lessons from TED, and apply them to their own presentations. What makes TED talks different from most business presentations? Let’s focus on three key factors. Many TED talks do not use any slides. They are not always necessary, and many business presentations do not need them either. Frankly, any business presentation would be more effective with no slides than with bad, text-heavy slides that actually stop the audience from listening to the speaker. People simply cannot read and listen at the same time, so the more text you put on your slide, the less you are communicating. TED speakers do not use slides as their cheat-sheets: slides, where they are used, are visual aids to help the audience to understand and remember their key messages. Business presenters should use them in the same way. If you need a cheat-sheet or notes to remember the flow of your presentation, that’s fine: keep it on a card or piece of paper in front of you, but don’t project it behind you. If you need to distribute information so your audience has a record of what you said, give them a short standalone document that summarizes your key messages, but don’t imagine that your slides will do that job. If they are good visual aids, they will not be a good handout. Use slides only where needed, and make sure they follow the 5-second rule: every time you click, the audience should be able to ‘get’ the new content in under 5 seconds. Otherwise they will stop listening to you, and the communication will be broken. Every TED speaker prepares their talk over a period of several months, with the help of professional presentation coaches. 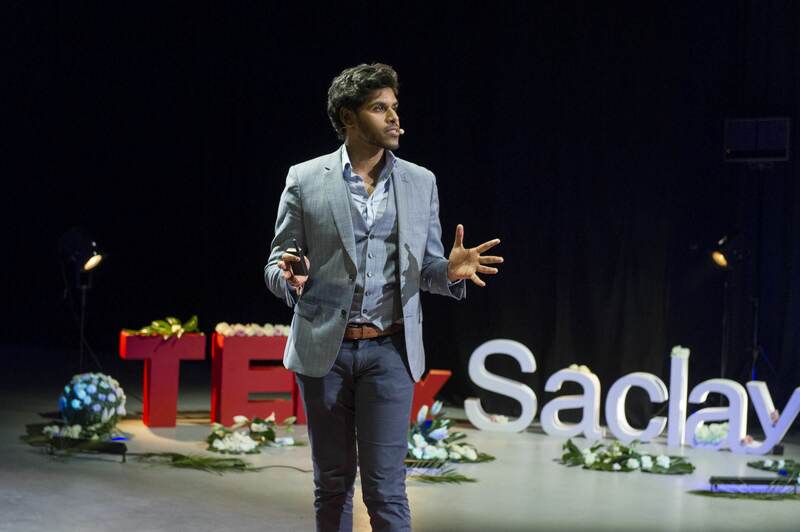 At Ideas on Stage, we’ve helped many hundreds of TED and TEDx speakers to imagine and create a fascinating talk, to illustrate it with breathtaking visual aids, and to prepare mentally and physically to take the stage and speak convincingly to their audience. Preparation is the key to success. For most business presentations, you won’t have the luxury of spending months fine-tuning your talk with specialist help. You have limited time and need to spend it wisely. But you can still prepare well, and your audience deserves a well-prepared presentation. If your time is limited, don’t waste it all producing slides. Slides are always optional, sometimes nice-to-have, but never necessary - especially if you are anyway giving your audience a short hand-out. Rehearsal, however, is required. If your presentation lasts 18 minutes - and ideally it should not be much longer - then it only takes an hour to rehearse it three times. The fourth time will be far more convincing than the first. So if you have limited time, skip the slides but take an hour to rehearse. It will be time well-spent and your presentation will be far more powerful as a result. There are many more: for example, your introduction should create an emotional reaction that makes the audience want to listen; and we remember information far better when it’s told in the form of a story or example. Those rules are just as applicable in business. If you apply these lessons to your next business presentation, the result might not look like a TED talk, but it will have a much better chance of energizing and inspiring its participants than a poorly-prepared speaker muddling through a bunch of boring bullet-points. Your audiences deserve successful presentations, and your business depends on them. If you’d like to learn more about TEDifying your business presentations, contact us at info@ideasonstage.com or fill in the form below and we’ll get back to you quickly.